We introduced a new tool this past week for DFS Golf. It’s called the Expected Putting Regression Tool (You can find it under the Fantasy Tools tab) and it’s a great way to decipher which players are running above and below expectation on the season. In tournaments like the DraftKings’ Golf Millionaire Maker’s, this tool should be very useful at helping us find under-owned values and over-owned fades. One new popular metric on the PGA Tour is called Strokes Gained. You can find a thorough explanation for it on the PGA Tour website, but in short, it’s a way of calculating how much better (or worse) a player is performing in relation to the field, for a given tournament and on the season. 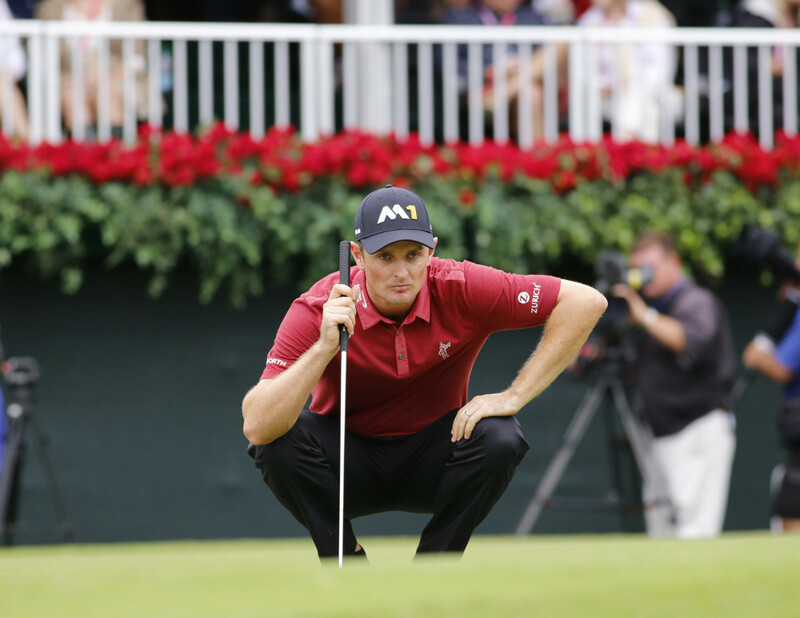 DFS translation: It’s an objective way of telling who really are the top golfers. The PGA Tour separates Strokes Gained (SG) out for different facets of the game. There’s SG Driving, SG Approach, SG Putting, etc. When I was discussing SG with Nick and Daniel recently, we all had a similar theory. Out of all the facets of golf, putting seems to be a skill that professionals likely won’t make drastic improvements on throughout their career. You’re either a naturally good putter, or you’re not. Obviously, this is somewhat of an oversimplification, but for the most part, we all felt that recent, drastic changes in SG Putting likely were a result of luck, rather than improved skill. Following this theory, we set out to find a way to use SG Putting to project a players putting skill, and calculate the difference in his performance this year. And that’s how the tool was born. One issue we’ve found with this tool is that it doesn’t take into account factors outside the numbers, like personal issues that may be cause a player to be distracted or and injury that might effect rhythm. For example, we rate Jason Day as the best putter on tour, and in 2017 he’s putted way under expectation, with a -.218 SG Putting per round. 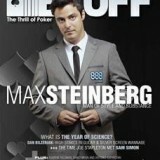 But as it turns out, his mother was diagnosed with Cancer earlier this year, which was clearly effecting his putting. When the change is really drastic, make sure to research and see if there’s something else going on. On it’s own, this tool isn’t terribly helpful. Putting is just one aspect of golf. 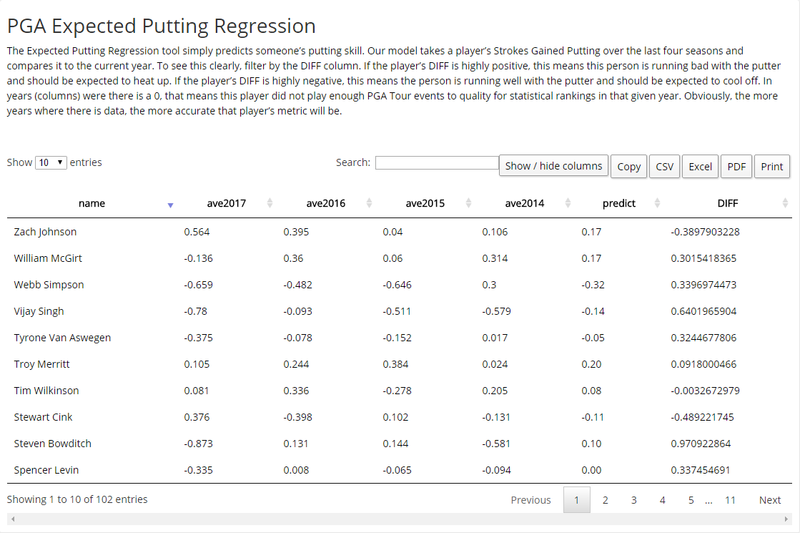 We recommend using this tool in tandem with FantasyLabs Golf (Which, in my opinion, is the best DFS Golf resource out there. Sign up here to try it out for $25 ) and with your own analysis of Strokes Gained Tee-to-Green. DraftKings new salary structure has little salary difference between the lower tier golfers, so choosing bad golfers who are also running badly in putting likely is not the way to go. Try to find the guys who seem to be playing well, but the putter just hasn’t been there for them this season. I haven’t done a lot of work analyzing plays for the Masters, but a couple of things stand out to me. Phil Mickelson seems like a good fade candidate. He’s had a great results this year and obviously has a ridiculous amount of experience on Augusta, he should be a popular play. But he’s been running unsustainably hot putting this year,and I think he’ll be overpriced and over-owned in the Millionaire Maker. In such a top heavy tournament, making a bold fade like this is a must. On the flip side, Bubba Watson seems like a great under-owned play. He’s missed 3 cuts in his last 6 tournaments, and hasn’t had a notable performance this year. But according to our tool, he’s been putting terribly this year. Given his experience at Augusta, he has a great chance to bounce back big at the Masters.